This node simulates the shading of a bevel along angles between polygons. The number of samples taken. More samples gives greater accuracy (less grainy or blurred result) but a slower render. 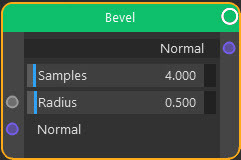 The radius of the bevel. In general this works best with small values. An input for the surface normal. The modified surface normal to give the bevel effect. You might connect this to the Normal input on a shader node, for example.